Many people hit an Atkins diet plateau a few weeks after moving from the Induction Phase to Ongoing Weight Loss, although you can hit a weight loss plateau at any time. Because every person is different, it may take some trial and error to figure out why you aren't losing any weight. Before you start worrying, be sure take into consideration factors such as illness or stress. These can often send your body into a "hoarding" phase, during which your body is simply hanging on to those calories for a while. If this isn't the case, keep in mind that weight loss isn't a steady progression. You may not lose any weight for two or three weeks, then suddenly drop 2-5 pounds. A true plateau lasts for at least four weeks. During Ongoing Weight Loss (OWL), you slowly increase your carb intake in order to find the amount of carbs you can safely eat while still shedding pounds. Many people discover that they've added carbs too quickly, resulting in a weight loss plateau that is actually their carb tolerance for maintenance. If this is the case, you can cut back your daily carb intake by 5-10 carbs daily until your weight loss is back on track. Lemon juice - yes, it has carbs! If you're in the Ongoing Weight Loss phase, eliminate the foods that are most likely to be the culprits. Start by cutting the last foods you've added that are carb heavy. In most cases, this will mean eliminating fruits for a while and going back to the more restrictive acceptable foods list you used during Induction. You should also eliminate alcohol if you've recently added wine, beer, or liquor to your diet. Sometimes simply increasing your water intake can help you break through a plateau. If you're getting plenty of water in your diet, you will process foods more effectively. Drinking lots of water will also help you feel full longer so that you're less likely to graze between meals or overeat when you do sit down to a nutritious meal. Remember, even if you're eating lean proteins and healthy fats, overindulging is never a good idea. If you've added exercise to your daily routine, you may hit an Atkins diet plateau that's deceiving. You may actually be losing fat, but the scale isn't budging because you've also gained some muscle. Because lean muscle tissue weights more than body fat, you could be losing inches although your weight remains the same. Try keeping track of inches lost instead of weight loss for a few weeks for a more accurate picture. 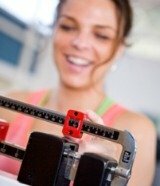 Finally, keep in mind that weight loss is a long-term, ongoing process. The occasional Atkins diet plateau doesn't mean you won't soon be losing pounds again on your way to a healthy, balanced diet and healthier body.